Nandi Mehta takes a free kick. 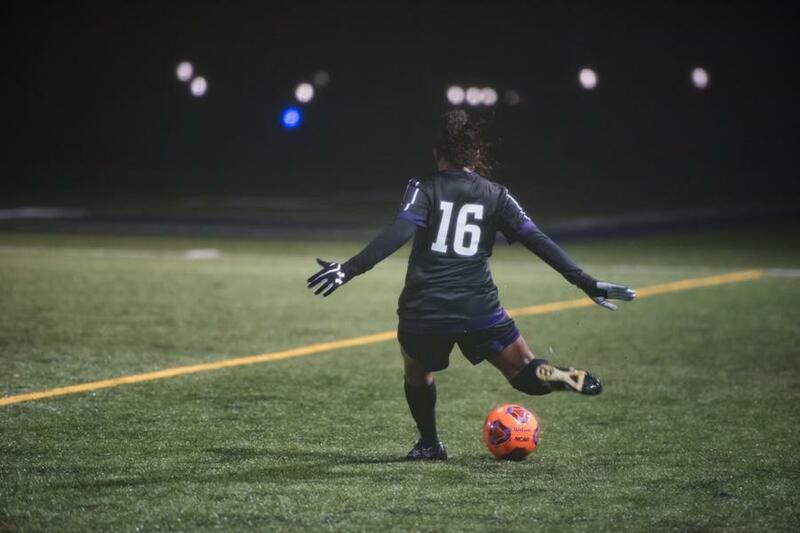 The graduate midfielder helped anchor Northwestern’s midfield all season en route to a share of the Big Ten regular season title. No. 20 Northwestern had scored an overtime goal from a scrum in front of the net to claim a share of the Big Ten regular season title, and nobody was sure who was responsible. The official scorers originally counted it as an own-goal knocked in by Illinois. Coach Michael Moynihan said he thought sophomore defender Kayla Sharples had put the shot on frame, but Sharples wasn’t sure she had gotten the last touch. “Honestly, it hit off so many people, and it happened so fast,” junior winger Kassidy Gorman said. Sharples was eventually given credit for the goal, but the confusion was befitting the Wildcats’ (14-1-3, 7-1-3 Big Ten) season — in their moment of triumph, the program’s first regular-season conference title of any kind, no one player could take the credit. The 1-0 overtime victory over the Fighting Illini (6-11-2, 3-6-2) was NU’s seventh 1-0 win of the year and a reminder of the team’s scoring struggles. The team lost its top two forwards from last season, Addie Steiner and Michelle Manning, to transfer and injury, respectively. When sophomore forward Brenna Lovera — still the Cats’ leading scorer with six goals despite missing the last eight games — was ruled out for the season with injury, NU was forced to rely on an ensemble of attacking threats to fill the gap. With some players unproven and with others playing out of position, the Cats have predictably struggled to score down the stretch of the season. In its past seven games, NU has scored just five goals and has had difficulty creating chances in the run of play. To come away from that seven-game stretch with four wins and three draws is a testament to the Cats’ ability to grind out results, shutting opponents down until an opportunity emerges to get ahead. With one of the best defenses in the country, anchored by center backs Sharples and fellow sophomore Hannah Davison, NU’s margin for error is large on the other end. As the Cats pressed higher and higher up the field late in Wednesday’s game — searching for the goal that would secure their place atop the conference standings — their back four stymied Illinois’ attempts to counter into the space left behind. And when the game ticked into overtime, NU was fully on the front foot, bombing forward to generate chances and nearly ending the game on a Gorman goal that was ruled offsides. It wasn’t pretty by any means. But when sophomore midfielder Marisa Viggiano whipped a corner into the fray in the 98th minute and the ball found its way into the back of the net, it ultimately didn’t matter to the Cats how it looked.